Among the many benefits of belonging to the Commonwealth family, and the sense of common purpose enjoyed by our citizens around the globe, are the opportunities for broadening and strengthening the ties that bind us together in all our variety. This publication offers many practical examples of ways in which educational partnerships allow us to gain from this greater understanding and to expand upon our shared Commonwealth experiences in a wider world. The Commonwealth Education Ministers’ Meetings are also exceptionally vibrant and inclusive through their parallel forums of all participants in the education community. The Commonwealth theme this year is ‘Connecting Cultures’ and, as the Queen, Head of the Commonwealth, pointed out in her Commonwealth Day message for 2012, ‘One of the great benefits of today’s technology-based world is the range of opportunities it offers to understand and appreciate how others live: we can see, hear and enter into the experience of people in communities and circumstances far removed from our own.’ Education provides the foundation of such understanding, and helps us build the knowledge and appreciation within which the rich diversity of our individual and collective identities can be valued and explored – to the enrichment of all our lives. The theme chosen for the 18th Conference of Commonwealth Education Ministers – ‘Education in the Commonwealth: Bridging the Gap as we Accelerate Towards Achieving Internationally Agreed Goals’ – recognises that we arerapidly approaching the end point for the current set of internationally agreed goals relating to education. As we take stock of progress towards the 2015 targets, the process for deciding what will succeed them is already under way.Discussions in Mauritius will allow us to reflect both on the influence of the Millennium Development Goals and Education for All targets over the last 15 years, and on how new frameworks for development might respond to the rapidly evolving global environment. Youth entrepreneurship and employment creation are asocial and economic priority for member states. Pathways through life and towards livelihoods are transforming the need to prepare our youth with the skills and attitudes to be job creators rather than job seekers, towards building social stability and economic resilience at both community and national level. Our Commonwealth commitment to respect diversity and to address the needs of vulnerable groups gives us the responsibility to place high on our agenda measures to promote economic and social inclusion – whether for youth, women or excluded minority groups. An expanding area of our collective engagement in the Commonwealth is through the vehicle of Sportfor Development and Peace. Nourishing our multiple identities, including as participants and enthusiasts for sports, supports the insights set out in that remarkable contribution to Commonwealth thinking, Civil Paths to Peace, the report of the Commonwealth Commission on Respect and Understanding. The Sports Ministers of the Commonwealth deliberated recently in London on how to enlarge on this area complementary to the work of the Commonwealth Education Ministers. How we make best use of the array of professional networks and civil society connections available to us in the Commonwealth has particular significance as the Commonwealth Secretariat prepares a new Strategic Plan as mandated by Heads of Government at their meeting in Perth (CHOGM 2011). Commonwealth Heads of Government asked us to examine carefully our full portfolio of engagement, and work has now started on developing a plan with atighter focus on those areas where the Secretariat has a significant proven or comparative institutional advantage, or which have the potential for significant outcomes. The core area of education is undergoing this scrutiny. 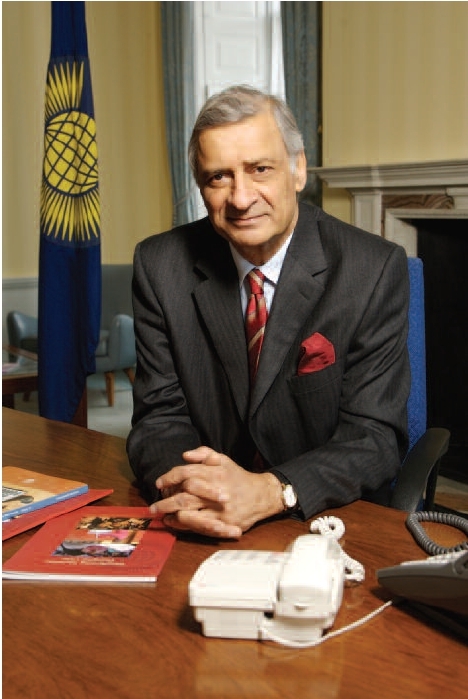 Education is an area which offers immense scope for the Commonwealth Secretariat to plan its programmes of work differently in order to achieve greater impact, through a stronger focus on partnerships with Commonwealth civil society organisations and professional bodies in the field of education, with other global partners, and by encouraging stronger direct linkages between member governments themselves. By using both traditional methods for dialogue, and the innovative means modern technologies provide for multi-directional consultation with a wide range of ministerial, official, professional and civil society stakeholders and partners, we should examine innovative and productive options for taking forward areas of work. Through utilising these new means for transacting and working together, progress towards our common education goals can be carried forward in imaginative and contemporary ways. Such an approach opens up possibilities for new and stronger interactive and strategic partnerships. The 2012 Conference of Commonwealth Education Ministers in Mauritius provides an opportunity to reflect on areas that can gain the most from collective Commonwealth focus, and the part that can be played by a range of stakeholders to optimise programme possibilities and partnerships, be they governments, civil society, foundations, private sector or the intergovernmental organisations of the Commonwealth – the Commonwealth Secretariat, Commonwealth of Learning and Commonwealth Foundation. We should be thinking of ways in which the multiple aspirations of our national education communities and their beneficiaries can best be served in contemporary ways. Some of the new and different ways in which key areas of our work on education and learning can be carried forward is through the creation of a Commonwealth Education Hub, with inclusive participation of a wide range of stakeholders in education from across the Commonwealth family. The Hub, allowing real time participation by them, can be a component of the Commonwealth Connects web space and will link education professionals, partners and beneficiaries across the Commonwealth to create a uniquely diverse but united network. This grouping has the potential to develop into the largest single education network in the world, with the ability to serve those broadly based and dynamic communities of professionals associated with primary, secondary and tertiary educational establishments. It would offer scope for facilitating collaborations, exchange of good practices, advocacy and knowledge-sharing to drive professional development. The provision of quality and meaningful education is a common challenge and all countries will benefit through sharing experiences and resources through the Commonwealth Education Hub. This emphasises the importance of information and communication technology (ICT) expansion and capability in member states. • Professional and institutional networks linking Commonwealth education systems. • Personal advancement and institutional capacity-building. • Sharpening Commonwealth infrastructure in education – networks of university partnerships, school links, commercial ties in publishing, examining bodies, consultancies and the like. • Enhancing the collaborative potential of the Commonwealth Education Ministers, Commonwealth of Learning, Association of Commonwealth Universities, Commonwealth Education Trust, and Commonwealth Scholarship and Fellowships Plan. • Promotion of the principal Commonwealth goals of democracy and the rule of law, economic development, and respect and understanding. • Youth development and diverse social benefits. Working together to explore new and imaginative ways of collaborating on education within and beyond the Commonwealth family also provides the opportunity of finding how we can work to ensurethat our collective Commonwealth values can be given expression in the emerging international development frameworks that will succeed Education for All and the current Millennium Development Goals. This publication reminds us of the breadth and depth of educational expertise and experience available in the Commonwealth. It is by drawing from this vast pool, through the changing circumstances over many years, that we have sought to develop new ways of educating and training our citizens. Our task now, through continuing reform and renewal, is to accelerate advance through good teaching and learning opportunities so that our youth can be equipped with the skills and abilities they aspire to and need for nation-building.